Smart GMail – Did you mean to attach files? Did you mean to attach files? You wrote “find attached” in your message, but there are no files attached. Send anyway? This alerted him that he missed on attaching the files. Isn’t that really smart and creative thinking! Though a minute thing, but such small things of intelligence makes GMail (Google) an innovator at email services. We have users in multiple countries and different vernacular for the same entity. Is it possible to create an alias for a record type that displays for users with a specific profile so we can use the same record types and records, yet have the customization between different countries? It’s almost like using translations, but it’s all within the English language. Terrence: Look at the new Translation Workbench feature. The Translation Workbench allows you to create translations for the customizations you’ve made to your Salesforce.com organization. Everything from custom picklist values to custom fields can be translated so your global users can use all of Salesforce.com in their language. Go to Setup | Admin Setup | Translation Workbench. Tom: You may also be able to utilize the Tags function. Setup / Customize / Tags. This would enable each user to “tag” the field with the name that they are comfortable with. That would help them with the different names in different areas. Paul: Unfortunately I don’t see how either of these options will work. The translation workbench does not specify English and English (UK) as two different languages, and I imagine if you set someone’s language to another language like Spanish then all of the standard tabs and fields are in that language. I don’t see how to change the translations for standard tabs and fields in the workbench. The tag feature is for tagging records, it does not allow you to tag fields, and it has to be done for each record. Your other option is to create two fields for each one that you want to modify. Setup a workflow rule or trigger that automatically updates the matching field whenever it’s entered. Then create two different page layouts that are used based on the user’s profile (so UK users would have to have a different profile from US users). Depending on the number of fields that you’re talking about, the second one could get really complicated. The modal works fine in IE 7.0 and Fireforx 3.0, it generates a transparent mask to prevent activating any elements in the document before closing the modal. But in IE 8.0, the transparent mask turns to “black”, rather than “transparent”. 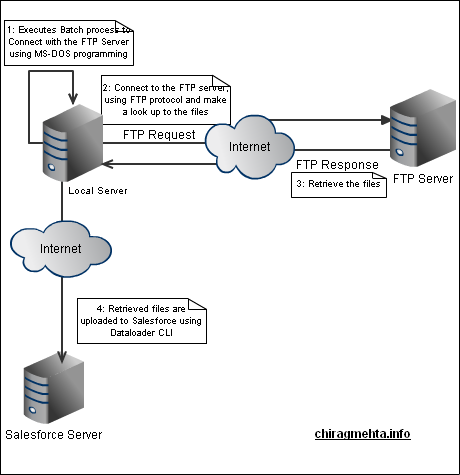 Using FTP servers to store and share files is very common now at days. 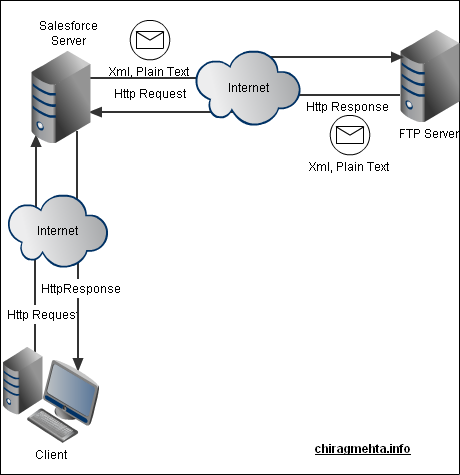 Most language programs let you develop FTP clients and consume their services. I – Data Loader CLI – Windows approach. First command in the batch file will be connect to FTP server (ms-dos command ‘ftp’) and then get the necessary files from ftp server to the local folder. 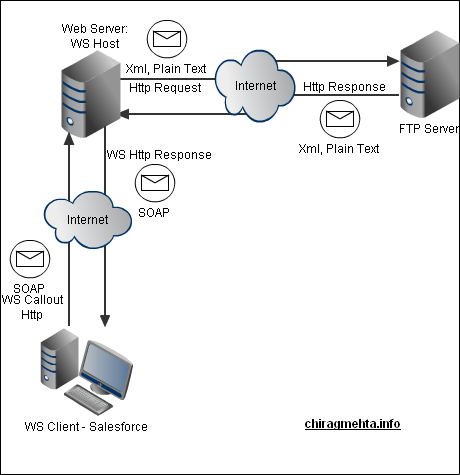 Second set of commands execute the Data Loader CLI jar and loads step3 retrieved file into Salesforce. To automate the execution of the batch, we can schedule the bat file execution using scheduled task feature of Windows operating system. Ps: The problem that you can face is the size of the files. Please remember that HTTP Request size are currently limited to 100Kb of data, so larger exports would fail unless a mechanism was created to utilize multi-part transmissions. Unfortunately we do not support citrix, so I may not be able to fully assist you with your case. 1. – Lotus Notes – I unfortunately do not have any information regarding the installation of connect for lotus notes in a citrix enviroment. If you consult the web boards at Developer.Force.Com and Community.Force.Com you may be able to find more information. Any possible solutions or workarounds on how to configure Lotus Connect & SSO in a citrix env? I’m including a Google Map on a page where users can sign up for a service. The page is accessed via SSL, and before I included the map, the entire page was transmitted securely. Now, however, browsers complain that portions of the page (the map) are transmitted insecurely. I understand the user information is still secure, but my users probably won’t. How can I change this page so that the google map is still available and users may still interact with it, but the entire page is delivered via SSL? The easiest way would be to proxy the connection to Google Maps. Depending on how much the user interacts with google maps, this may be really easy or a little annoying. You can use an SSL proxy script. I did that with a client’s site which uses the Enterprise License, and the client’s Google representative confirmed for us that it is OK to do it this way. I’m not sure if it is OK to do it with the free license, but I assume it is OK too. Have a custom link or button on the page that opens the map in a separate window. In our case the users did not want to see the map all the time. Therefore, I have the link on the relevant page and they can click it to open the map when they wish. They will still see the warning but only when they have to look at the map and not every single time they load the account page. Implement Yahoo Maps instead, which has a simple querystring-based API to pass a location in, and retrieve an XML document containing a URL to a map image. Users can’t pan/zoom, but it’s a simple compromise, they can click a button to open a full map. EXCEPTION_THROWN|[45,19]|System.CalloutException: Callout from scheduled Apex not supported. When Twitter was designed, they took a different approach—they didn’t require a relationship model like that of a social network. Keeping things open meant you could browse their site to read tweets from friends, celebrities, companies, media outlets, fictional characters, and more. You could follow any account and be followed by any account. As a result, companies started interacting with customers, celebrities connected with fans, governments became more transparent, and people started discovering and sharing information in a new, participatory manner. Twitter have developed a new set of frameworks for adding this Twitter experience anywhere on the web. Soon, sites many of us visit every day will be able to recreate these open, engaging interactions providing a new layer of value for visitors without sending them to Twitter.com. Above image lists initial participants who will be using the new Twitter experience over the web!